Pictures of the Royal Palace of Caserta. Photos and Images of Casertas sumptuous state rooms and water gardens. The Royal Palace of Caserta was the residence of the Kings of Naples in Southern Italy. Construction by the Bourbon Kings of Naples starting in 1752 under Charles III of Naples who worked with Luigi Vantelli on its design. The building was completed by his third son and successor, Ferdiand IV of Naples. 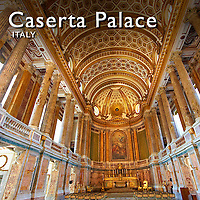 Caserta is the largest in terms of Volume of all the Royal Palaces in the world. Its base covers 45,000 square meters and its 5 storeys rise to 36m high, the main facade has 143 windows and the building contains 1,200 rooms with 34 staircases. The Royal Palace of Caserta was built to mimic and rival Versailles as the greatest palace in Europe. While cast in the same mould as other 18th century Royal establishments, the monumental complex of Caserta establishes a broad sweep of design that incorporates the imposing Palace and park into its surrounding natural landscape. The Royal Palace of Caserta was designed to be the centre of a new town and an industrial complex to produce silk. Water for the new complex of ponds and fountains, the Place, town and factory was brought 38 km by a new aqueduct. The inside of the Palace is decorated with sumptuous frescoes and furnished in 18th century classical designs befitting the great Bourbon Kings. 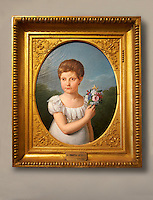 Many of the private rooms of the Place are decorated in the Empire Style which was the second phase of Neoclassicism which ended in about 1830. The Baroque gardens are typical of the period with formal vistas that stretch away from the rear of the palace rising gently to the base of a hill from which water cascades down 150m to an ornate basin with statues that depict Diana bathing watched by Acteon. From here the water run through a series of square ponds down a gentle slope towards the palace in the distance. From the fountain of Diana these ponds look like one continuous straight sided canal that mysteriously runs downhill towards the Palace in the distance. This masterful piece of visual trickery increases the perspective of the vista. The last King of Naples , Francis II, lost his Kingdom to the forces unifying Italy in 1860, less than 100 years after the building of the Palace started. Francis II was the last of a long line of Kings of Naples that stretch back to the Norman Roger II of Sicily who absorbed Naples into his realm in 1139. Today The Royal Palace of Caserta is a UNESCO World Heritage Site and a major tourist destination. It can also be seen in Star Wars i and II and Mission Impossible III, both of which have scenes filmed at Caserta.